We understand consulting as a process in which attitudes and behaviours of people or groups are influenced in a targeted manner. In doing so, we look at the impact of our interventions on the entire social system. The needs of all are balanced in such a way that the goal and purpose of the company can be optimally pursued by all. The motivation or mood in your company is bad? Communication between managers and employees is no longer correct? Conflict resolution requires more energy than the actual work? Conflicts, crises or difficulties of communication rarely arise from nothing. External consulting enables you to better assess the events and their causes in your company. It complements your inner perspective and looks at what you can miss as part of the organization. Our advice creates a solid basis for conscientious decisions. Do you need trainings that fill your PE strategies with life and are experienced by your employees as practical and profitable? Frontal instruction before the flip chart is not enough. Transformation is the magic word with which your employees become better. Didactic conception, motivating exercises and in-depth reflection make your training a success. We support the development of the individual as well as the organization. We communicate positive thinking and appreciation and enjoy doing what we do. We promote sustainability by providing transfer impulses. We work specifically with feedback as a basis for behavioural changes. We support our trainings with written and electronic media. We train skills that have to be mastered for everyday work. We link information recording with emotional learning experiences. We recognize the personal learning needs of the participants through targeted diagnosis. We enable reflective and structure-forming learning. Managers and employees of your company face a central professional challenge. You are looking for a sparring partner for decision-making. Coaching takes place on the basis of a sustainable, mutual acceptance and trust, voluntarily desired consulting relationship. 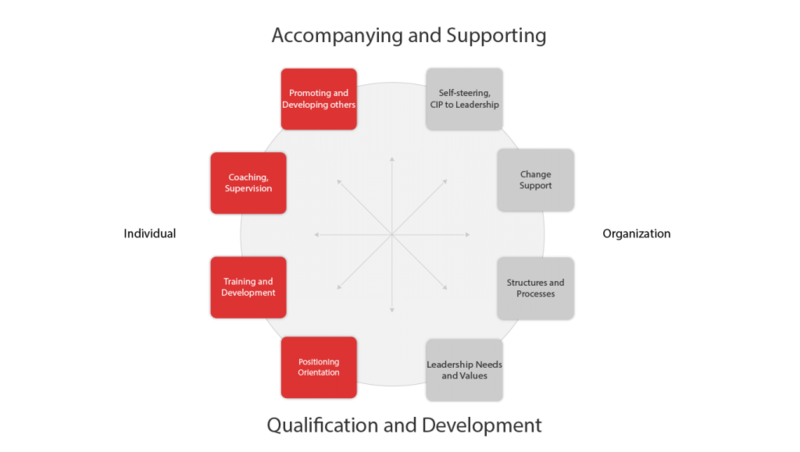 We understand coaching as a way to accompany and support people in their development. The coach is subject to absolute confidentiality, also towards the client, who has initiated coaching for an employee. The coach is aware of his own limitations and recommends a therapy to the coachee if necessary. An excellently equipped toolbox has to do two things. On the one hand, it provides all the necessary tools to master even complex challenges. On the other hand, it contains the best tools to successfully complete each individual task. The KONZEPTE-Sixpack is our toolbox for a systemic consulting process. You don’t know us. But you should get to know us: And we you. So that we understand what you need. So you can see what we can do. And so that together we can design your goal, determine the start and determine the route. If you don’t ask, you won’t win: That’s why we have intensive discussions with you. If necessary, we involve other switch makers in the company and determine the need for action of your organisation in a structured manner. Whoever has a choice leaves us in agony: you are rightly entitled to the best interventions with the best methods at the best time. We determine what is best for you and outline the path to success. If you want to be successful, you need to know what success means: Together with you, we define your success criteria in a measurable form. And now that it’s getting serious, it needs another one of you: The commitment to engage in the agreed clarification and intervention process. What lasts a long time is no longer good: we disenchant outdated methods, demask dysfunctional processes and structures. And because each affected person has his or her own point of view, we include them in our analysis. Good noses on site, but not undercover: We interview your executives, employees and teams. Analysis workshops help us to track down your challenges. We identify the rest on the basis of your relevant documents. Your potential is not unleashed energy: That’s why we use your competence and actively involve your people. Because what you need to improve is almost always hidden. What if not? Then you get it. Challenges to touch: Your deficits provide an X-ray of your options. You will receive a status report of your strengths, weaknesses, potentials and opportunities. And a final definition of goals that has moved from the gut to the head. Speak plainly: ruthless? If need be, that too. With many perspectives? Absolutely. You recognize your status quo and we will show you a way to maximize the development of your company. Seeing is not understanding: That’s why we verbalize and visualize: in a written short report, by means of a presentation in the circle of decision-makers and your staff meeting. So that everyone knows what they are up to, what comes and what needs to be done. The affected person is often concerned: More understanding and trust means less uncertainty and more motivation. We communicate appropriately and openly, agree appropriate interventions and support your executives in finding acceptance with the employees. Why talk around the bush: you receive a comprehensible assessment with binding statements on your situation as well as a concrete planning of effective personnel and structural interventions. We receive the order to accompany you to success – if everything fits you. Hands on instead of half-measures: transformation doesn’t work if few people act and many watch. That’s why everyone is involved. And because “voluntary” is important, any doubts that arise are eliminated and meaningful changes are agreed upon in a clean manner. Let’s get down to it: New target agreements and contracts, cross-line project groups, workshops, clarification and training. Training, coaching, team development programs. Not always everything, but the best and most effective in the right order. Motives and possibilities make people: Competence and personality models are based on individual further qualification. Employees participate in the clarification process and agree binding action plans including personal milestones in the transfer of practical experience. Change was yesterday. Today’s Flow is: Your project groups are working successfully. There is agreement on efficient processes and structures. But not only about organizational matters, but also about social rules and result-oriented, appreciative communication. The cartographer has nothing to do with the path: We do. Because we know not only what works, but also what can go wrong. That is why we accompany you until your measures have been implemented, so that you can make transfer experiences, evaluate them and so that you can use new findings successfully. Your practice is always our practice: We support your implementation on site – through live coaching in the ongoing process, by exemplary support of your executives and meaningful feedback, which becomes tangible feedforwards. What has to, has to, what can, is supposed to: Everyday working life and operative activities cannot stand still when you transform. Together, we make sure that day-to-day business and transformation is not mixed up, that you convert your ship on the open sea without losing speed, in order to be even faster and better later on. As the pilot leaves, so do we: But not until the job is done. Until then, we take over the controlling on site, check the suitability of the production and control your process in practice until success. We support you in dealing with new forms of leadership work and show you how it all works. In the long run, instead of short breath: your transformation should not remain a flash in the pan. We verify and prove that your change is a long-term success, that it will drive your business forward and increase employee satisfaction. For a modern and future-oriented company. No reading in coffee grounds: A final report proves the before-and-after of your transformation. A well-founded forecast reveals your further potentials and shows you the way how you can actually tap them. Those who stand still fall behind: It takes time for innovations to establish themselves in the organization and become part of its culture. Regular feedback prevents recidivism into established patterns and prevents that misunderstandings lead to incorrect routines. The future in graphs and figures: A comprehensive, meaningful report draws up a record of success for what has been achieved. Surveys and evaluations document the achievement of the agreed success criteria. Surveys assess whether the changes have reached the hearts and minds. Just as your company works concentrically in all directions, so does our KONZEPTE-Sixpack. The trick is to put you on your feet while in full swing. Your processes stay in motion, your business runs without restriction while we work with you to optimize, maximize and enhance. We evaluate the success comprehensibly. In order to achieve this, we rely on tried and tested instruments and methods of personnel and organisational development as well as the latest findings from industrial psychology and management research. Our toolbox is our vest pocket. We pick out the best tools for you and know how to manage them for you to achieve great results. And because your identity is irreplaceable, you end up recreating many new things while still retaining useful older things. Do you need selective support and are you looking for concentrated impulses in order to tap potential and permanently eliminate deficits? We are there for you: with training courses, seminars and workshops, coaching, team development programs and consulting services that support you in reaching the next stage of your company’s expansion. But we have to warn you: once you start, you may not want to stop getting better and more efficient. That’s why we deliberately focus on long-term cooperation. Because we enjoy your success and want to actively participate in it if you become and remain the best company you can be. Organizational development is inconceivable without personnel development. People shape a company and the company shapes people. Of course, the tasks are different in both areas. Nevertheless, it is a misconception to assume that you can introduce new processes and structures without touching people or developing employees, without confronting the organization with new challenges. In the complexity of modern organisations, it is important to set management impulses in such a way that maximum 360° effect is achieved at the intervention site with regard to person and system. The spheres of influence of additional impulses must be productively integrated. Concentric management and leadership in this context means systemic thinking and acting. In this way, companies can exploit the riches of complexity without wasting energy, producing costly mistakes and at worst failing. For this reason clarification, analysis and feedback are part of our consulting and further education services. Because the more you know about your organization, the smarter and more sustainable you are. Start with us and do the right thing to get the right things done.